New and salvaged materials come together in a rustic-inspired DIY headboard. 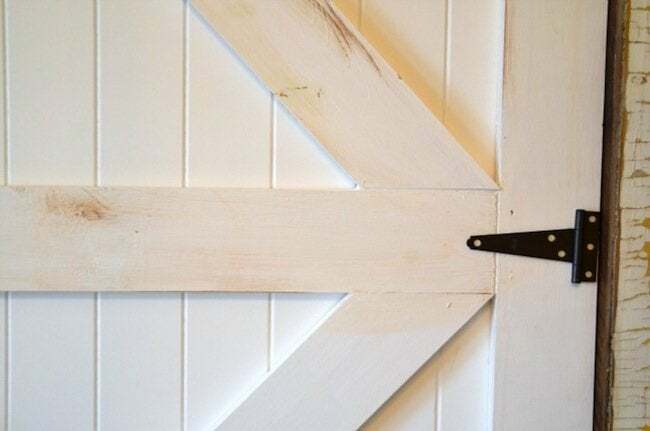 We’ve seen a resurgence in barn door decor over the years but when we spotted this project from Beth at Home Stories A to Z—a barn-inspired DIY headboard, we fell head over heels, so to speak. 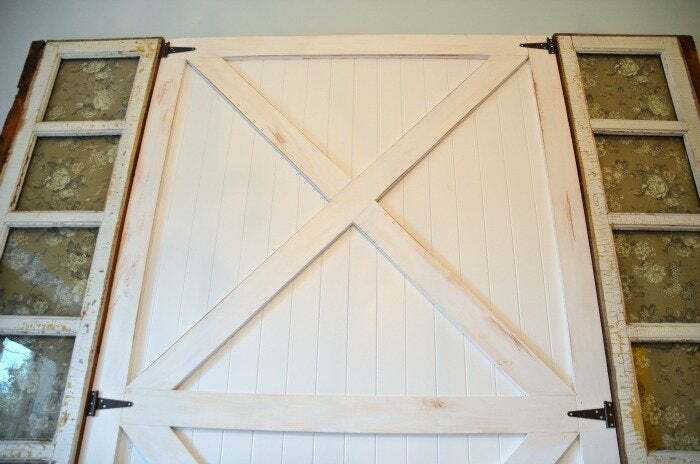 What’s more, because she and her husband, Matt, had antique side doors on hand, the project only cost them $90.57. 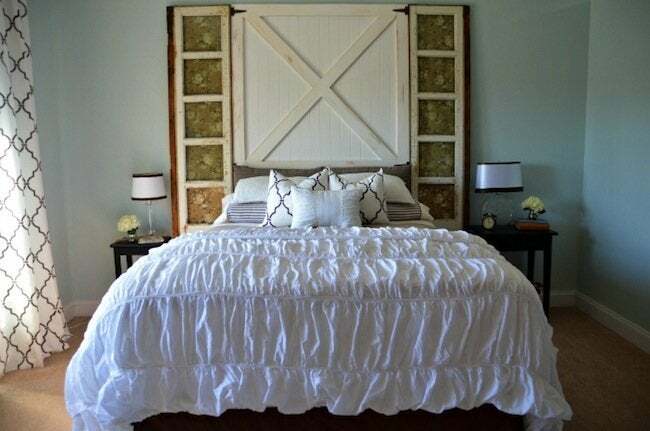 We think their hard work speaks for itself in this one-of-a-kind headboard. Read on to see how they pulled it off. The hardest part for us was figuring out the measurements. Matt and I stink at math and the brainiacs who decided to make dimensional lumber measure differently than the actual size stated didn’t help matters! FYI: a 1″x4″x 8′ is really a 3/4″ x 3 1/2″ x 8′. 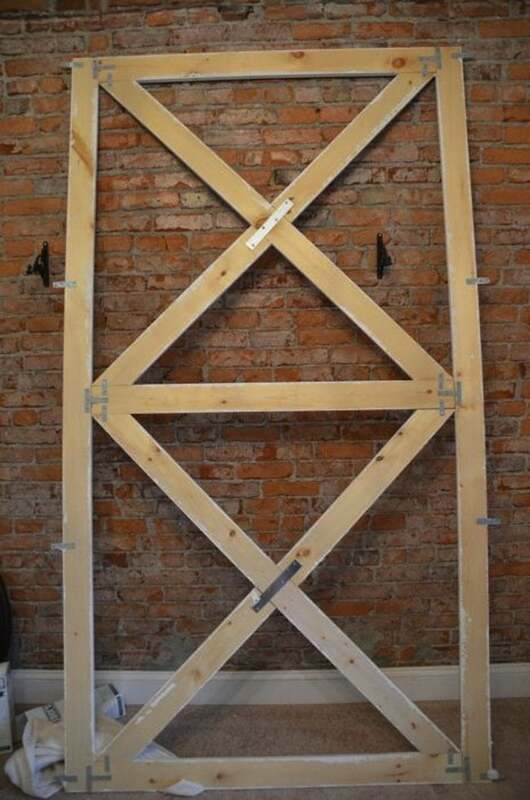 The height of our doors and the width of the sheet of beadboard we used to back the headboard frame helped determine the dimensions. 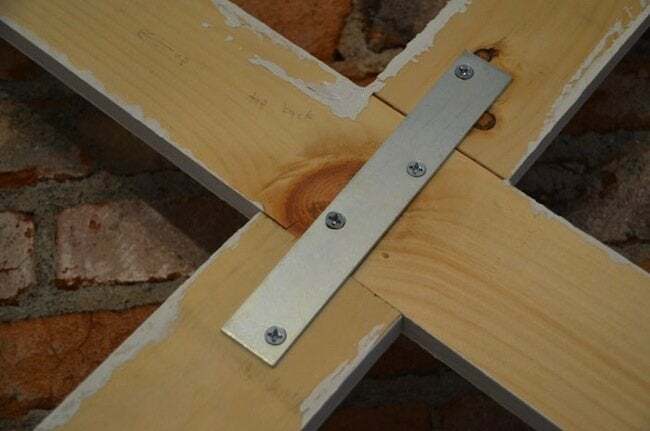 Once we had the pieces cut, we screwed them all together using mending plates. You can see that we wrote notes to ourselves in pencil which piece was to go where. Doing this saved us a ton of time in reassembly after the boards were all cut! Once the frame was finished and painted, I nailed the beadboard into place by hand. (My dog chewed through my nailgun cord!) 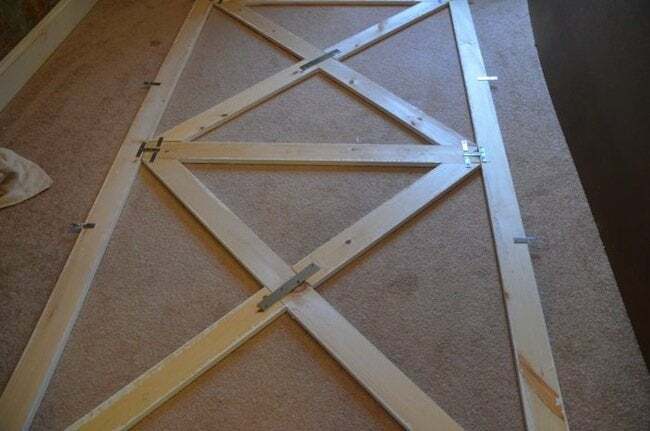 Then Matt screwed the frame into the two windowed-side panels using more mending plates. To paint the headboard, I used General Finishes milk paint in Snow White. I didn’t use a primer on the wood first; I just went for it with the milk paint. I sanded a few spots on the headboard to create a worn look and used the burnt umber glaze over the top. I bought cheap gate hardware in silver and spray painted them ORB. I just hot-glued them in place because I was tired of drilling :). Yes, we might get hit in the head by a random piece of flying hardware in the middle of the night, but that’s the risk of laziness that I’m just willing to take right now! Thanks for sharing, Beth! To see more pictures from her master bedroom makeover click here or check out her site, Home Stories A to Z, for more inspiring tutorials.